Does My Tooth Look Good In This? Sometimes a front tooth may not look very good. It may be chipped, worn or discoloured. It may have one or more large old fillings that have become stained or don’t match the colour of your surrounding teeth. A replacement filling may not be an option because the surrounding tooth structure could of weakened over time due to tooth decay. In instances like this, it may be advisable to consider a veneer. If you are concerned about the look of your teeth because of chipping, tooth wear or discolouration, then a veneer is definitely the option you are looking for. Veneers are all about aesthetics. It can be thought of as a resurfacing treatment for your teeth much like what false nails do for your fingernails. False nails are glued to the front of the real nails, resulting in a new appearance while the real nails remain underneath relatively unchanged. Veneers provide a similar effect for teeth. The tooth under a veneer is not significantly altered, but the veneer on top can provide the desired new shape, size and colour. 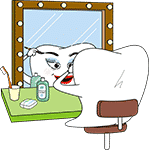 Like false nails where all the fingernails on each hand are usually covered, veneers are commonly done on all teeth that are most visible when someone smiles, typically the front 6 upper teeth. Veneers can be made from porcelain or composite resin (tooth coloured filling material.) Porcelain veneers are made in the same way crowns are made. At the first appointment, the tooth is first reshaped and an impression taken of the prepared tooth. A plastic temporary veneer is placed to cover the prepared tooth while a Dental Technician makes the final veneer using the impression in a Dental Laboratory. Usually 2 weeks later, the final veneer is ready to be fitted onto the tooth at a second appointment. Porcelain veneers are beautiful restorations that can look amazingly natural. Composite resin veneers are a cheaper alternative to porcelain veneers. Composite resin veneers are directly built onto the tooth usually in one longer appointment, with the result immediately visible. However, composite resin is basically a reinforced plastic material. Because of this composite resin veneers have less strength and aesthetics compared to porcelain veneers. They can wear and slowly lose their shine and colour over time. They can be renewed by surface polishing or by re-coating their surfaces with new composite resin so that it is not always necessary to replace the whole veneer over time. Have We Got A Veneer For You? How Did We End Up Veneer? As we’ve mentioned, a veneer is used for aesthetic purposes. Over time no matter how much care you take with your teeth you will likely end up with some wear and tear. Even the most regular patients find that their front teeth don’t look as fresh as they did in their teenage years. Small chips and minor tooth wear are not uncommon on our thinner front teeth. While regular brushing and dental checkups can prevent the need for veneers, there really is no beating the clock on this one. Don’t let minor issues with your front teeth affect your confidence in day to day life. What you are experiencing is not uncommon and a veneer is an excellent solution to restore that new tooth look. Veneers are not something you’ll need all the time, and not something you have to have. But if you are finding your confidence is down because of a little bit of wear then just prioritise the solution. The people around you want to see that beautiful smile and you need to have the confidence to show off those pearly whites. An attractive smile is worth more than a simple money figure. However, money tends to be the major limiting factor when it comes to achieving an attractive smile. Many patients know what dental veneers or teeth veneers are. They understand what dental veneers can do for their smile. They want dental veneers, however they also think that dental veneers cost a lot of money and are out of their price range. Some patients opt for the cheaper material simply because of cost. They know the difference between porcelain veneers and composite veneers. They understand that dental veneers in porcelain are stronger, more aesthetically pleasing and last longer than those made in composite resin. However, the prices of porcelain dental veneers stop them from choosing this material. Composite dental veneers are cheaper and can give quite a good result, but don’t give the best result and do not last a long time due to chipping and staining issues of the weaker material. Some patients are so restricted by the dental veneers cost in Brisbane and Australia in general, that they even look for options overseas, like getting dental veneers in Thailand. The prices of their package deals may be cheaper than in Brisbane, but dental tourism or dental vacations come with their risks and may cost you more money if something doesn’t go as planned.